Eddie and Leo Mesner, owners of Aladdin Records, had had lots of great groups on their label: the Robins, the 5 Keys, the Feathers, and the Sha-Weez, to name a few. But there was only one that they thought good enough to name after the label itself: the Capris (whoops, that probably needs some explanation). 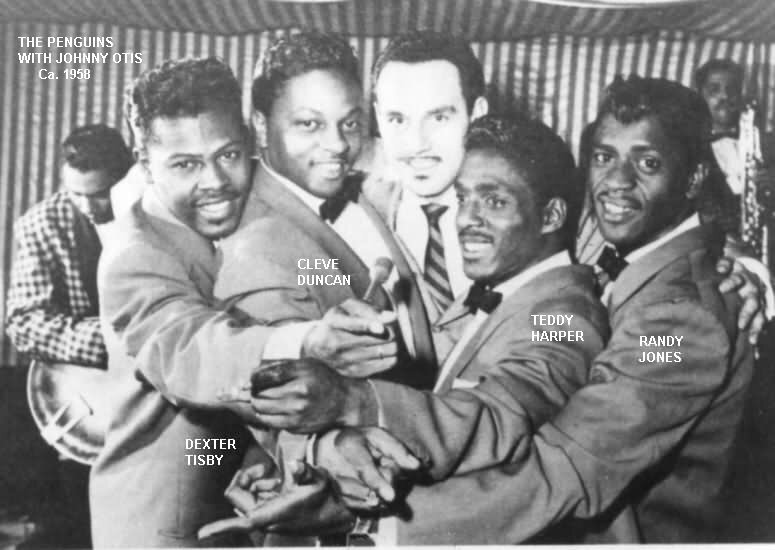 While most of the R&B groups of Southern California came from a handful of schools in Los Angeles, the Capris defied tradition, forming in San Diego. Teddy Harper's musical background began in his church choir in San Diego. Said Teddy: "I never thought I'd be a good singer; I just liked to sing. I didn't think I was going to make any money at it." But it was a good time to try: "To give you an idea what I'm talking about, in those days you could walk three blocks and within those three blocks, somebody was singing - no matter where you were." By the time that Teddy, a second tenor, got out of the National Guard in 1953, he had decided on a singing career. Various people would congregate at the Harper household to sing; about a dozen of them eventually formed their own groups. The circle of San Diego singers enlarged as they met others from Los Angeles, who came down to appear at shows at the Lincoln and Victory Theaters. The interaction between San Diego and Los Angeles continued, as Teddy went "up to L.A. to listen to what everybody was doing at Bobby Byrd's house and Gaynel Hodge's house." 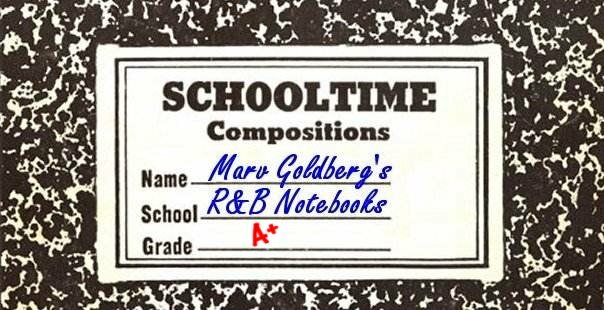 If we close our eyes, we can imagine about 20 singers congregating at Bobby Byrd's house and forming themselves into four or five groups to practice the R&B hits of the day, along with their own compositions. 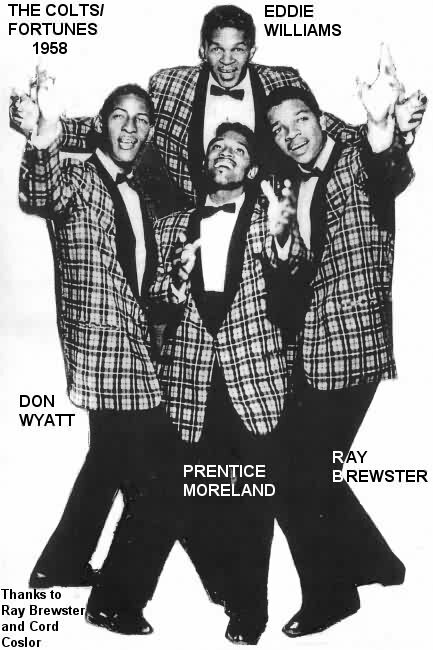 (Bobby Byrd, bass of the Hollywood Flames at the time, would later become famous as "Bobby Day.") There were several other houses in L.A. where this activity took place: the homes of Jesse Belvin and Cornell Gunter were also centers of singing activity. 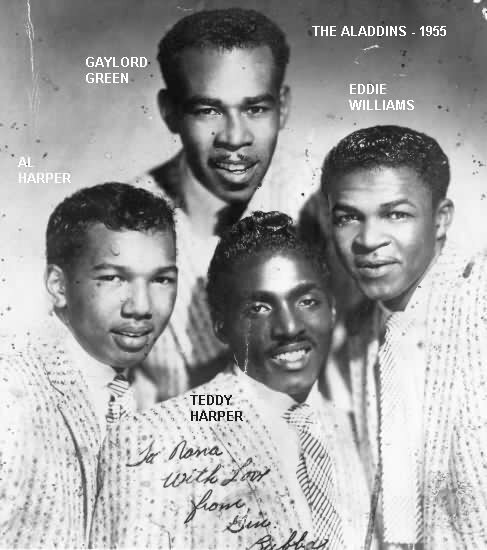 Rounding up his brother, Alfred (baritone), Eddie Williams (lead tenor), and Gaylord Green (bass), Teddy began molding them into a singing group: the Capris. While singers in eastern and mid-western cities frequented hallways and subway platforms "looking for the echo," the Capris practiced by sitting on lawns in San Diego (a much more relaxed way of dealing with things). "We practiced every day. Everybody in the neighborhood would come out on the lawn and listen to us practice." Another of Teddy's brothers, Reginald, managed the Victory theater in San Diego, and the Capris appeared there in the Thursday night amateur shows, emceed by L.A. DJ Hunter Hancock. At one of these shows, bandleader Johnny Otis heard them and offered to take them on some tours. 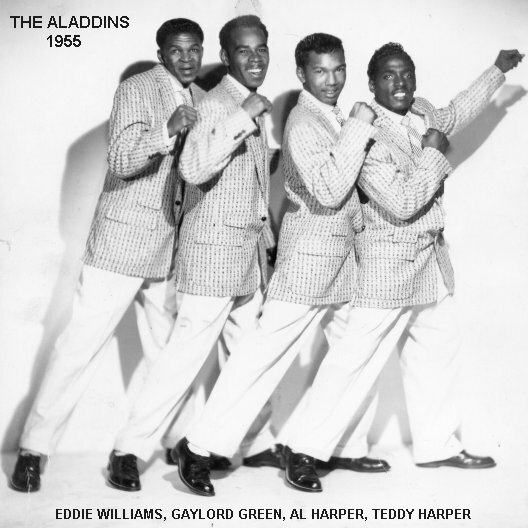 In late 1954, after the Capris had toured with Otis for about a year, he introduced them to Aladdin Records owner, Eddie Mesner, who was impressed enough to encourage them to rename themselves after his label: "the Aladdins." The Aladdins had a manager, Frank Gallo, whose name appears on their photo, but what his contributions to them were remains unclear. On January 4, 1955, the Aladdins held their first session with Aladdin. They recorded five songs: "Cry Cry Baby," "Eternally," "Help Me," "Remember," and "Lord Show Me" (which ended up being released with the wrong master number). The first two were led by Teddy Harper, the others by Eddie Williams. While someone at Aladdin liked "Remember," they weren't particularly happy with its recording. So on March 24, the Aladdins were back in the studio to re-record it (more successfully this time), along with "Get Off My Feet" (led by Teddy and Eddie), and the incredibly beautiful "I Had A Dream Last Nite" (fronted by Eddie Williams). 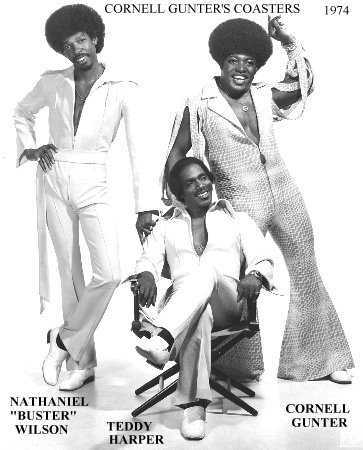 "Remember" was written by their manager, Frank Gallo, and Johnny Otis. Since Otis was also involved with Etta James, she was also given the song. She recorded it, with the Flairs backing her up, sometime in early 1955, but it remained unissued until a 1961 Crown album. Their first record was released in April 1955: the second version of "Remember," backed with "Cry Cry Baby." It was reviewed on April 30, with both sides getting a "good" rating. Other reviews that week went to Fats Domino's "Ain't It A Shame," the Penguins' "Be Mine Or Be A Fool," the Inspirators' "If Loving You Is Wrong," the Marigolds' "Rollin' Stone," the Dominoes' "Love Me Now Or Let Me Go," the Spence Twins' "Do Bop Sha Bam," the Val-Tones' "Siam Sam," and the Feathers' poorly-rated "Why Don't You Write Me." In May, the platter was reported doing well in Harlem. Did they sell many records? Teddy didn't care! "40 records in those days was a hit. As long as each girl in the neighborhood had one. We didn't think about the money, all we wanted to do was sing. $22.50 a side, each. That's all we wanted. All we thought about was the $22.50 a side, the girls, and who'd try to steal the show." Teddy continued, "They didn't have any choreographers, or accompanists, or accountants, or attorneys. What was good about it was all the hell we went through; all the groups stuck together until they couldn't make it anymore, because there wasn't any money out there for you. Today everyone knows the [monetary] value of music. When we were coming up, if we'd tell our mothers we had a hit record, they'd laugh. Today, if a kid is interested, his parents are right behind him, 'cause they know the value. If the majority of entertainers when we were coming up had their parents behind them, they'd be in great positions today." The next record was issued by Aladdin in September 1955: "I Had A Dream Last Night," backed with "Get Off My Feet." It was reviewed on October 15 (once again getting "good" ratings), along with Chuck Berry's "Thirty Days," the Robins' "Smokey Joe's Cafe," the Moroccos' "Somewhere Over The Rainbow," the Chanteclairs' "Believe Me, My Beloved," Jesse Belvin's "Where's My Girl," the Ravens' "On Chapel Hill," Tony Allen & the Champs' "Nite Owl," the Evergreens' "Very Truly Yours," and the 5 Notes' "You Are So Beautiful." The Aladdins went back into the studio on February 20, 1956 to record two more songs, both led by Eddie: "All Of My Life" and "So Long, Farewell, Bye Bye." These tunes became the Aladdins' third release, issued that same month. The record doesn't seem to have been reviewed, but its competition was the Turbans' "Sister Sookey," Shirley & Lee's "That's What I'll Do," Varetta Dillard's "Darling Listen To The Words Of This Song," the Jacks' "How Soon," the Counts' "To Our Love," and the Feathers' "Lonesome Tonight." In the summer of 1956, Teddy Harper briefly joined the Penguins, to replace Dexter Tisby. Once Dexter returned, however, after a couple of months, Teddy was out of a job. "Help Me" and "Lord Show Me" (both from their first session) may have been released in December 1956 (but it probably never was). Things seemed to be somewhat chaotic at Aladdin at this time, and Teddy never received a copy of this record (he didn't even think it existed). If it was issued at all (and I don't know anyone who's ever seen it), it would be their rarest side. The record wasn't sent out for review, but if it had been, chances are it would have made it to the trades the week of February 16, 1957, at which time it would have faced competition from the Teenagers' "Teenage Love," the Cadillacs' "Sugar Sugar," the Buckeyes' "Since I Fell For You," the Federals' "Come Go With Me," the Squires' "Dreamy Eyes," and Sonny Knight's "But Officer." By the end of 1956, the Aladdins had broken up, never fulfilling the Mesners' hopes for them when they were named after the label. Eddie Williams went off to join the Colts/Fortunes (he'd later be in the Hollywood Flames) and by late 1957, Teddy Harper was back with the Penguins, this time replacing Curtis Williams (he would remain with them through 1962). Actually, the Aladdins did re-form for a few months when the Penguins had some down time, but although they did a few shows, the spark was gone and they soon disbanded permanently. Teddy's take on R&B music was simple: "It had to be the sweetest music anybody could ever attempt to sing or write. You didn't have the arrangements you have today. All you had was a tenor, bass, and baritone." NOTE: There are four other unreleased sides, all recorded in 1958. These are by a different Aladdins group, about which nothing is known.